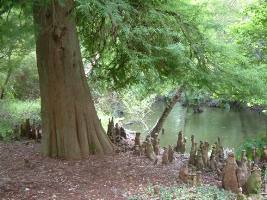 Taxodium distichum is a tree to 40 m; Gymnosperm; trunk buttressed at base, bark reddish brown, shallowly furrowed, fibrous-flaky; lateral roots forming “knee” projecting above level of water or wet soil around the tree. 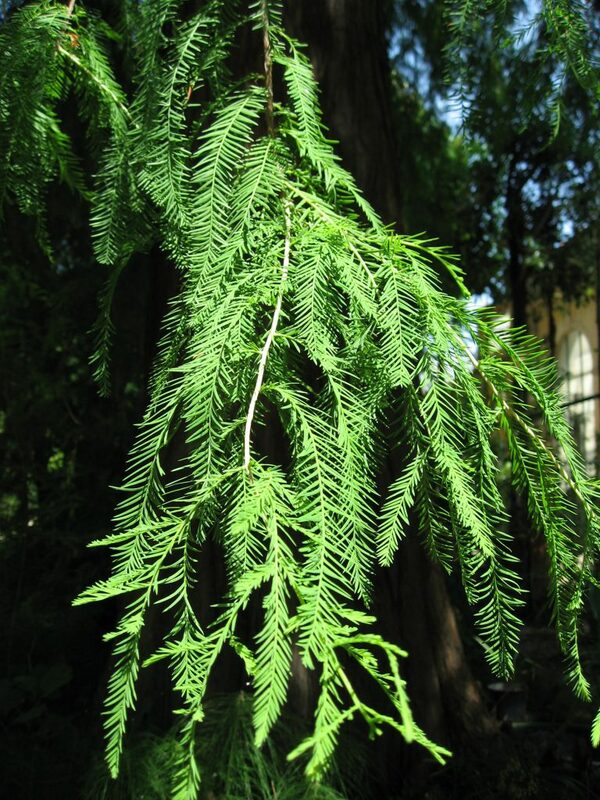 Leaves: needles and small twigs deciduous; linear, flat, to 1.5 cm long, appearing 2-ranked along twigs. Flowers and Fruit none. Monoecious; female cones round, 2-3 cm thick, scales thick. Origin: Southern US, MD and south. Habitat: Lately popular as a horticultural planting in wet areas and pond shores (Central Park, NY). Not known to escape.